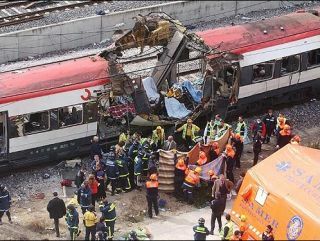 The ongoing trial of 29 men accused of carrying out the Madrid train bombings in 2004 is, unsurprisingly, a maximum-security affair. But now there's a chance to peek inside the courtroom and follow the proceedings live. Legal services company Datadiar is showing live coverage video streams of the trials on its website. The YouTube -style window on the website also offers archived video testimonies from the trial, which began last Thursday. Datadiar has teamed up with the Audiencia Nacional tribunal, which has made the live video stream possible. Four cameras are posted at various angles in the court, and a fifth shows documents presented as evidence. Forty-three microphones are scattered among the tables of the lawyers, and recordings are stored on DVDs. The website offers a series of briefings explaining elements of the legal process, such as the concept of the presumption of innocence. It also has a seating diagram of the courtroom and the 46 defence lawyers, prosecutors and translators. Cristina Cortijo, a Datadiar manager, said: "We believe this issue is a very important one in the world, and people are looking at us. It's critical that people know that our company is doing this objectively with real-time transmissions and no cuts. And it's for free." Judge Gómez Bermúdez said the national court chose to open the bombing trial to broad viewing because "there are so many victims, and they can't all fit in the courtroom". In the US, cable channel C-span already covers government proceedings without commentary. Canada has just started a pilot project to test cameras in the courtroom in a prominent murder case. And in California, full television coverage of the rock producer Phil Spector's forthcoming murder trial will be shown. The trial - which is to decide who was responsible for the terror attack on Madrid's commuter trains on 11 March 2004, killing 191 and wounding more than 2,000 - is expected to run until late 2007.